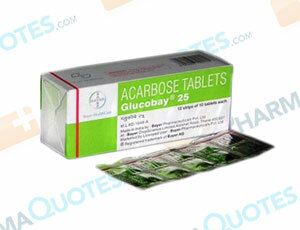 Acarbose is a drug used to lower blood sugar in patients with diabetes (high blood sugar). Acarbose should be used in combination with a proper diet and exercise program to treat type 2 diabetes. It cannot reverse diabetes, but can help prevent some negative outcomes of diabetes like: kidney damage, nerve problems, and loss of sight, limbs, and sexual function. It is best taken three times per day with the first bite of breakfast, lunch, and dinner. Your doctor may prescribe a low starting dose, gradually building up to the long-term treatment dosage. Side effects of acarbose can include gas, stomach pain, loose stools, and bloating. Major side effects to watch for are allergic reaction, low blood sugar, and liver problems that can become fatal. Patients should look for signs of liver failure (dark urine, fatigue, loss of appetite, yellow skin or eyes). Before using this medication, patients should notify their doctor if they experience intestinal or bowel problems, kidney problems, or liver disease. Be sure to tell your primary care physician of all current medications and allergies so he or she can make the best decisions about your diabetes treatment. General Acarbose Warning: The above information is for informational purposes only and is not meant to be a substitute for professional medical advice, diagnosis or treatment. Please seek professional medical advice before starting, changing or terminating any medical treatment. Pharmaquotes is not offering medical advice, pharmaceutical recommendations or endorsing any specific prescription drug, pharmacy or other information on the site. Pharmaquotes provides no warranty or guarantee for any of the discount data, medication, or other information.